Browse: Home / General / ACHIEVERS VISIT A SCHOOL! (St. Paul) – Most people only dream of getting the chance to meet someone whose inspirational life story they have read about in a book. But 7th graders at Linwood Monroe Arts Plus in St. Paul got to not only meet some of the people featured in Achievers: Ordinary People Who Do Extraordinary Things, they were able to shake the achievers’ hands, and ask them questions about how they made it. Rapper Korey Dean, office products salesman Ray Noble and restaurant owner Eddie Hutchins spent some time at the school this spring, sharing what they hope are the takeaways from their stories with the kids. Each Achiever visited with two 7th grade classes. “No matter what happens, never quit!” said Dean enthusiastically as he walked around the circle formed by desks occupied by students in one of the classrooms. “The key to success is to focus on the needs of others,” said Noble, as the kids in the classroom where he was speaking looked on in awe. Dean, Noble and Hutchins are among the people with notable stories about how they made themselves a success that Twin Cities author Rob Severson chose to feature in his book. Like him, they had roadblocks in their way, but were able to overcome them. In Severson’s case, he was what he calls an “underachiever” in school, but when his wife became pregnant with their first child, he knew he had to step up and make something of himself. He eventually worked his way up to president of a bank subsidiary. Severson also realized that the kids he wanted to reach would be more likely to identify with ordinary people like themselves than the rich and famous. Therefore, he sought to tell the stories of achievers who his readers would admire and be able to emulate. 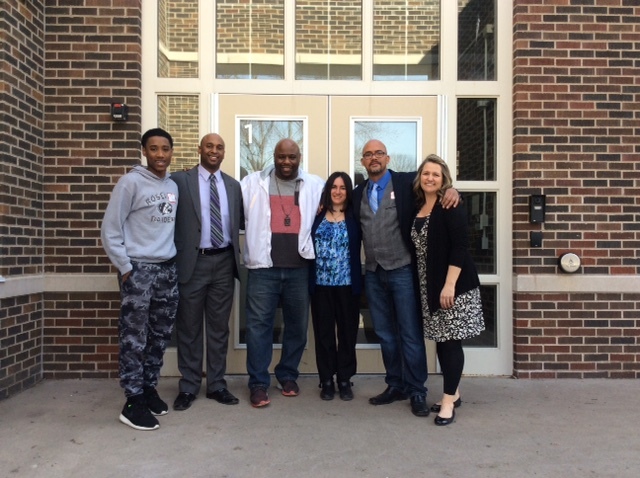 Immediately after learning about the book at the end of the 2013-2014 school year, Bryan Bass, principal at Linwood Monroe Arts Plus in St. Paul, decided to incorporate the text into his school’s AVID program. This year, 8th graders in the program have read the book in connection with the Conversation Series, in which students hear success stories of ordinary people. The 7th graders who met some of the achievers on March 11 will be using the book in their studies next year. School counselor Amber Remackel says she was very impressed with the questions the kids had for the guests. “How are you able to get yourself out there and meet people in the community?” asked one of the male students. “What was your favorite subject in school?” asked a female student. “I think these students are really going to enjoy the additional exposure they get to college and career readiness through the AVID program next year. They are ready,” said Remackel. Dean, Noble and Hutchins agree, and are looking forward to returning to the school for more interaction with students in the not-so-distant future. “I believe sharing stories with students is important as it lends relevance to what the kids are learning and how they can apply their teaching to a real life experience. It’s powerful to hear a real life story of challenges that lead to success. It is my hope they would say ‘wow he went through that and still done well, maybe I can do it too,” said Dean. “I enjoyed speaking to the kids. It was raw, it was honest. And if my words inspire one kid to chase his or her dreams, then mission accomplished,” said Noble. For more information about the book, visit www.robseverson.com. To request a review copy of Achievers: Ordinary People Who Do Extraordinary Things, or arrange an interview with the author, contact Rachel M. Anderson, Publicist, at 952-240-2513 or rachel@rmapublicity.com.